I’ve been interested in Unmanned Aerial Vehicles (UAVs) ever since I did some work at the Air Force Research Laboratory in Mesa, Arizona, where one of the programs was the development of the Predator drone. These pilotless aircraft are flown in dangerous reconnaissance and strike missions in Afghanistan and Pakistan while controlled remotely thousands of miles away. I’ve always been fascinated by the technology, and wondered what kind of peaceful applications could be possible. A class of UAVs, called Micro Air Vehicles (MAVs) has been in the news recently. These are tiny aircraft that are being developed to observe hazardous situations that are inaccessible to ground vehicles. Because of the small sizes involved with these machines (some having as little as 15cm wingspans!) one of the challenges with MAVs has been aerodynamic stability. Bird and insect flight has been an inspiration for engineers trying to overcome this, but practical limitations continue to exist. One bizarre but fascinating variation on MAV development is the “Cyborg Beetle”. In this approach (pictured above), various components are deployed directly onto a host insect (a green june beetle, in this case) to in effect “hijack” the insect. A piezoelectric energy harvester converts energy from wing movements to power sensory instruments like cameras and microphones. 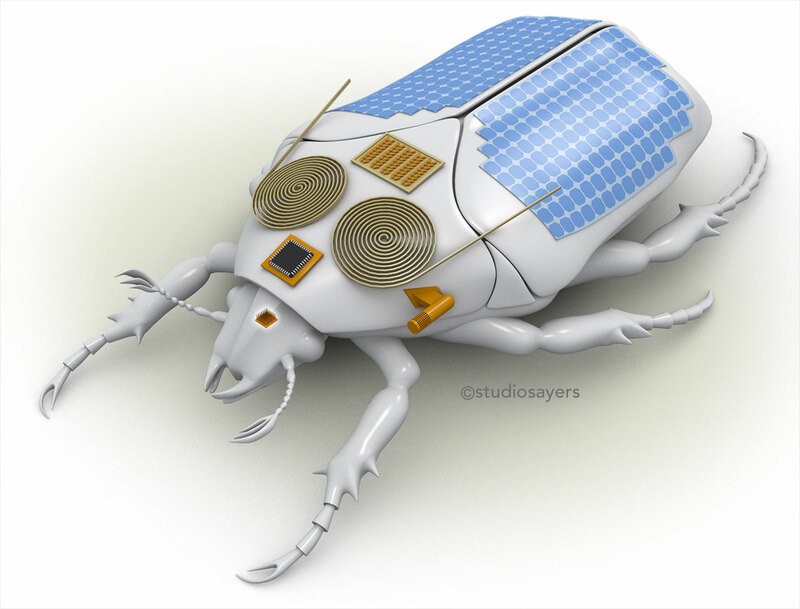 Additional electricity is gathered from thin-film solar cells as well as a thermoelectric energy harvester which taps the insects body heat. A neural implant allows a human “pilot” to control the insects flight. One could imagine a swarm of these being released into a mine disaster or earthquake relief situation, their tiny sensors relaying information from areas inaccessible to relief workers. I thought the blending of organic and electrical components in this amazing, yet vaguely disturbing technology would make an interesting technical illustration. Let me know what you think of the rendering, the cyborg beetle technology, or MAVs in general! How small is the Cyborg Beetle? Green June Beetles are about 25mm long. Other insects they're experimenting with are larger.